A decent enough performer but if the 'designed for acoustic' features are not that important to you there may be better options. Simple operation; excellent build quality; a sound that works for electro-acoustics; modern or classic flavour choice. Extra footswitch needed; more variations of delay would have been good. 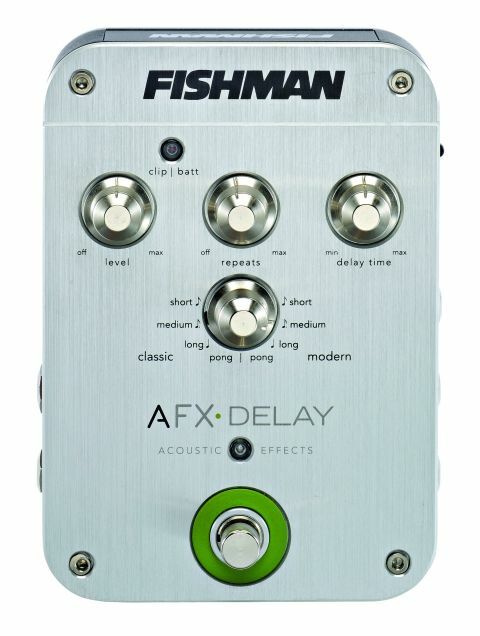 The AFX Delay pedal was made for use with acoustic guitars. All AFX pedals feature stereo inputs. This delay pedal follows the recent trend of providing both the clean sound of digital delays and the softer sound of vintage analogue delays. To this end there are four 'Classic' and four 'Modern' presets - each category having short (up to 350ms), medium (up to 1.5sec), long (up to 2.9sec) and stereo ping-pong delays. There's a knob for adjusting the actual delay time and one for setting the number of repeats. The pedal also includes a tap feature - there's a footswitch input jack so you can add a momentary switch to create eighth, dotted eighth or quarter notes automatically. The footswitch can also initiate a Delay Hold feature for short phrase-sampling that lets you play along to infinitely repeating short loops of up to 2.9 seconds. Tonally, the 'Classic' side of the pedal works best for us, as repeats gradually lose top end and blend in more than the repeats on the 'Modern' side that stay pristine and just get quieter - you may prefer that of course, so it's good to have the option. Apart from the ping-pong delay, which can be a bit gimmicky, this pedal provides straight down the line linear delays with enough variation in delay time to set up sounds from metallic sounding reverb through short slapback, rhythmic repeats and the type of long delay that lets you layer sound and play along with yourself. The footswitchable functions work fine but you do need an extra switch and, as there are plenty of delay pedals out there that offer inbuilt tap tempo as well as more delay variations like multitaps etc, the feeling is that Fishman might have taken this particular pedal a bit further. If you play an electro-acoustic on stage and want more variety in your sound or just more control over it, rather than leaving it to whoever is working the PA, then this pedal may be for you. It is a little pricey so will probably only appeal to the really committed, but what you get is classy sound and a build quality that looks like it would last a lifetime, so the expense could be justified.